It is beet season and time to get cooking. Don’t they look festive? Today, Snack Girl is shouting out to her favorite southern town, Athens, Georgia. After five long years of gradual school, the place grew on me. Was it meeting the band REM that convinced me that the place was cool? Nooo. Though that was pretty fun. The cuisine of the region, with its grits, fried green tomatoes, and boiled peanuts, is distinctive. A new book by Athens native Rebecca Lang has hit the bookshelves and it has sweet tea, fried chicken, and biscuits. And picked beets, which Rebecca was nice enough to share with us. I happen to love pickled beets and they are super easy to make. You do not have to formally “can” these (heat up the jars). These will pickle in your refrigerator and make a great side or salad addition. If you are looking for a present for a aficionado of Southern cuisine, "Around The Southern Table" is a great choice. The photos are inspiring and the food is easy to make. Is it healthy? Some of it is and some of it isn’t. Many of the recipes fall into the “treat” category, but a cookbook like this reminds you to stay off the stale donuts and save up for the really good stuff. Have you tried pickling beets? What are your favorite "treat" cookbooks? 1. Trim beet stems to 1 inch; gently wash. Place in a medium saucepan with water to cover. Bring to a boil; cover, reduce heat, and simmer 25 to 30 minutes or until tender. Drain, rinse, and cool slightly (about 15 minutes). 2. Peel beets, halve lengthwise, and cut crosswise into 1⁄4-inch-thick slices. 3. Divide beets and onion slices among clean canning jars or other heatproof, nonreactive containers with lids. Divide ginger and next 2 ingredients among jars. 4. Combine vinegar, remaining ingredients, and 1 cup water in a medium saucepan. Bring to a boil, stirring to dissolve sugar and salt. Pour hot vinegar mixture into jars, covering beet mixture completely and filling to 1⁄2 inch from top. Let cool 10 minutes; cover and chill 24 hours before serving. Store in refrigerator up to 3 weeks. These look delicious and very festive! like to give these a chance. I LOVE pickled beets! I always grow beets in my garden, but next spring, I'm trying new varieties of them, too! (I already ordered the seeds, so Come On, Spring! lol) This recipe with fresh ginger sounds marvelous! Thanks, Lisa! Greetings from Athens GA! 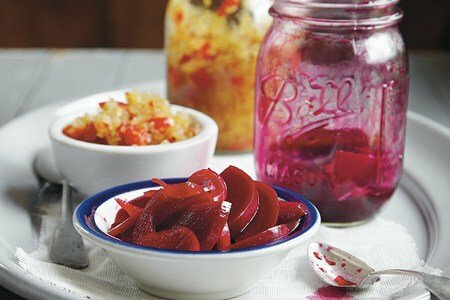 Pickled beets are great, and this recipe looks even better than any I have come across. Adding this to my pickle recipe collection immediately. Got my beet bed dug this weekend, so joining Lita in waiting for spring to try some different varieties of beets. Love pickled beets! Try them sometime with some cottage cheese. YUM! My mom would use pickled beet juice to make pickled eggs. They were awesome and looked really pretty. One of my best childhood memories is of helping my grandma pickle beets. After they were cooked and cooled you could literally squish them out of their skin -- messy but so much fun. This recipe is different from grandma's but it is worth a try -- thank you for posting. I make a really simple recipe as I love pickled beets and being on WW I simply add vinegar to a can of beets and then sweeten to taste with splenda or other sweetener. Refrigerate overnight and they are ready the next day. Very good and very very low in points. Maureen, that's exactly how my mother made pickled beets. I grew up in East Tennessee and we had them frequently.